I want to share a new line of enquiry on kebari choice. New to me at least. It's really just a sneaking suspicion at this point, but looking back over notable days on the water over the last few years, maybe there's a pattern. 'Maybe' because this is a continuing experiment: geology as a determinant of kebari choice. What does this mean? Well firstly kebari, because this idea applies to flies fished subsurface - classic tenkara style - rather than dry fly presentations. Let me explain by empirical observation (that's about as scientific as this is going to get). The photo above is a grayling I'm releasing back into the River Derwent, caught the autumn before last on a very pale cream coloured sakasa kebari shown below. I remember that this fly attracted a lot more attention than other patterns that day. Recently, I fished the same spot again with the same result, in fact over two days of fishing in hard conditions, I couldn't win a take on any other pattern. You can see in the photo that the water has a rusty tinge to it, coloured by the sediments eroded out of the local Millstone Grit rock and its overlaying soils. This is a constant feature of this particular river. 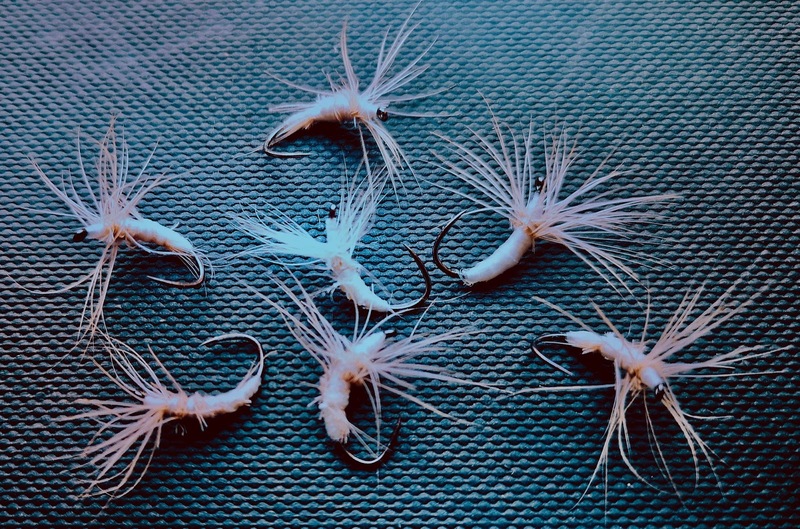 The almost-white kebari I fished didn't represent any hatch going on but it did stand out well as a target in the stained water, while more drab, buggy colours were all but invisible to me at least, on a test drift past my waders. I imagined a fish holding near the river bed, waiting for food items to drift by, with only a few seconds to locate and lock on. Who knows, perhaps the greater visibility of the pale colour extends this window of opportunity a little, especially when the river is heavier and more coloured. 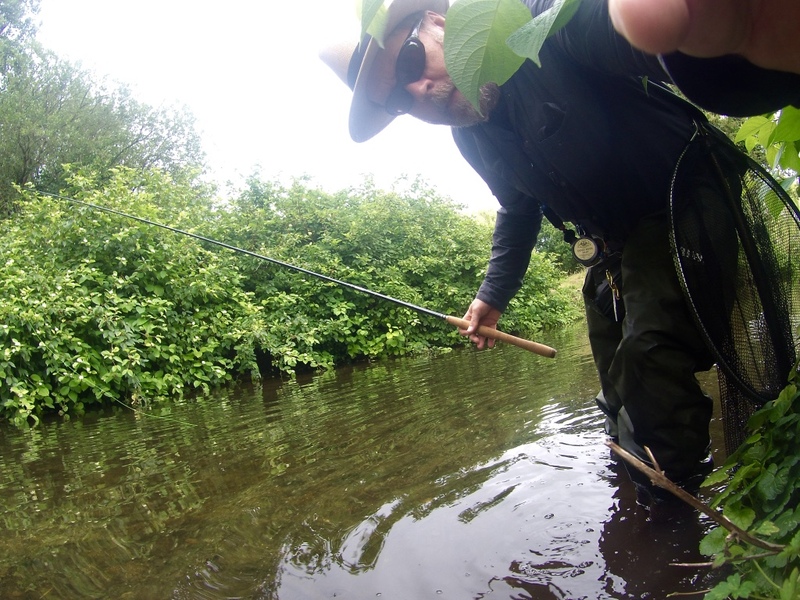 At the other end of the country in Cornwall, a little river I fish is whisky coloured - not cloudy with sediment like the Derwent - but with more of a clear, brown coloured tint. This arises from the peat bogs laying over the granite of Bodmin Moor, at the headwaters. On numerous trips to this river, trying a variety of fly colours, again it was a white kebari that took the most hits from the local trout. On one trip I even scavenged some materials locally from the landscape to make a white fly, knocking up the 'Herring Gull kebari' pictured below. It wouldn't win any fly tying awards but it sure catches fish. I'm sure the stand-out colour in the tumbling peat stained water is the reason it has the edge over the other kebari I have tried. Both of these rivers could be classified as 'freestone' as they originate at high elevation, running over rocks, pebbles and gravels and lack the luxuriant weed growth of the lowland rivers of southern England. 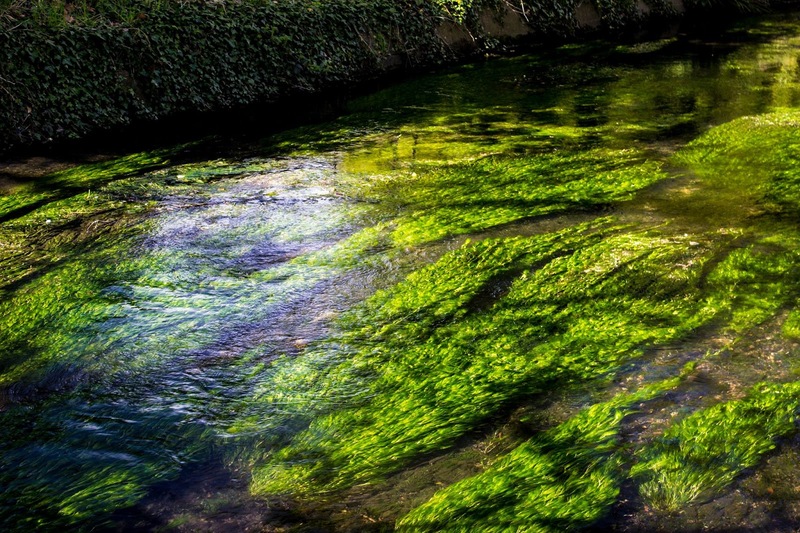 Here, on the nutrient rich clear chalk and limestone rivers I find that if I'm fishing alongside green weedbeds, then a red-brown hackle stands out well against the green and catches me plenty of fish. But when I'm fishing the clear golden gravel runs with no weed present, then I'm not so confident of a take. Here I seem to do better with very pale colours again or solid black hackles that give a strong silhouette. This idea hasn't developed as a conscious policy, but sprang into my mind as I looked back over the kebari that have worked best for me on certain rivers. I've long known of the advice to choose a fly that you can see well in any given light condition, to aid visual detection of takes. 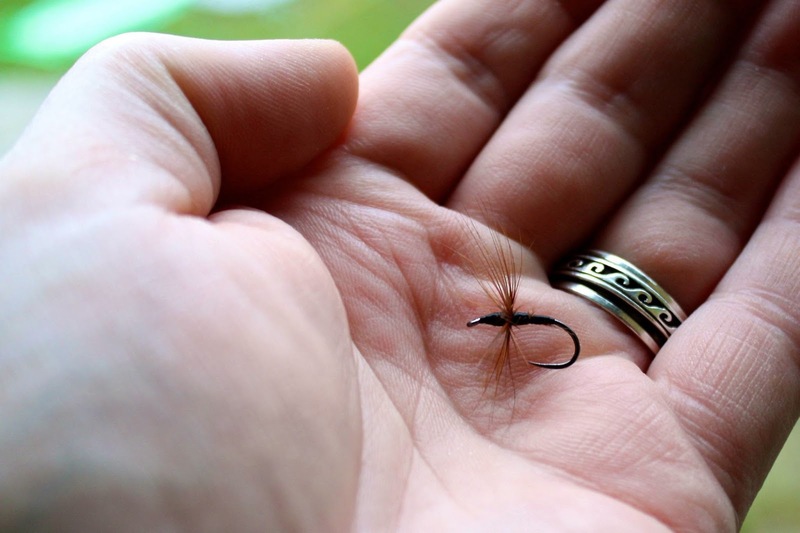 Why not flip that around and choose a fly that will make an easier target for your fish? A zillion miles away from entomological theorising on fly choice..tune in again for more heretical flyosophy. 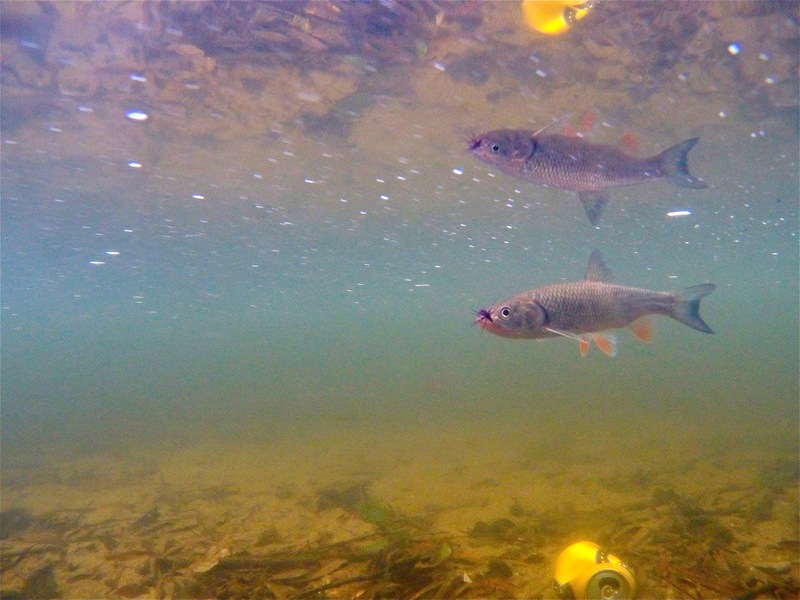 Food for thought and for trout. A comment back on this post from my friend Drew encouraged to expand briefly on this idea. "One thought on geology, and the turbidity and staining would also come to bear on this too. 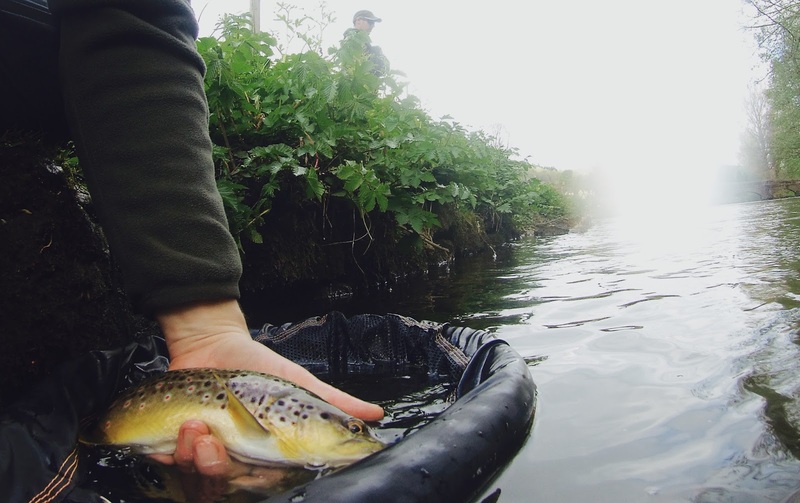 We know the trout sees the dry fly dipping the mirror of the bottom of the stream reflected on the underside of the surface. Now it’s not unreasonable to suppose that the same mirror would provide a background to the upward looking fish, against which our sub-surface fly is presented. So, if the mirror is predominantly dark a light coloured fly would stand out all the better. With a light gravel stream bed and consequently light mirror a darker fly may well be a better option? Interesting to speculate on these things"
This is very much my thinking too. I know that a camera lens, the human eye and a fish all see things differently but a mirror is a mirror. I first got this idea after taking underwater shots.. in the photo below you will notice the claret coloured kebari that stands out well against the golden gravel of the river bed and reflected in the mirror. Directly over the fish is a cone of vision that is effectively a window through this mirror to the world above. We can't see this window from the angle in this photo but it's there. 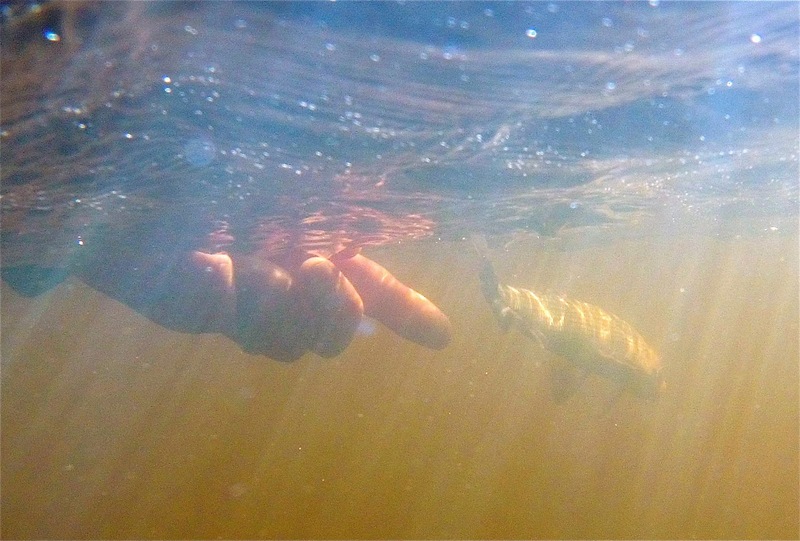 Through this the fish can see us if we get too close or stand too tall. Outside of the limits of this window in the mirror, fish see the reflection of whatever is beneath. This is of importance the the fly fished wet and the fishes' opportunity to react.